Synopsis: On Chinese New Year’s eve, Tangyuan and Jaozi were all ready to spend the holiday at their grandparents’ home when Mummy and Daddy suddenly broke news that their grandparents are coming from the south to celebrate Chinese New Year with them. To cheer up the children, Daddy tells a story about Peppa celebrating Children’s Festival with her parents. Upon arrival, Granny tells the story about the unexpected events that Peppa encountered on the second day of the Children’s Festival. Granny and Grandpa’s arrival lights up the family with their holiday spirit. 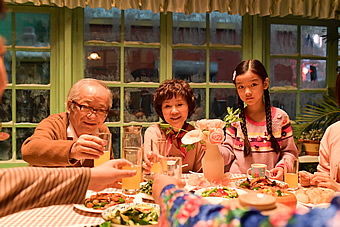 Together, the family experiences the Chinese traditions, encounter unexpected events. Just like Peppa and George, every experience teaches them to love life, families and friends. 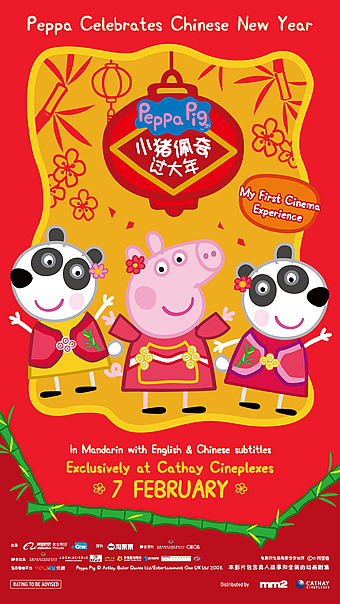 It is testament to the popularity of Peppa Pig in Mainland China that it is getting its first big-screen feature tailor-made for the Lunar New Year holidays, and to those worried that the character might not survive the cultural crossover well, we’d like to reassure you that it is as authentic a treatment as you’d probably imagine. Oh yes, the parts with Peppa, her brother George and her parents Mommy and Daddy Pig are for the most part comfortingly similar to that of the cartoons on TV, except of course that they are now in Mandarin than English. Among them, there’s one with Peppa visiting the kids’ carnival for a camping trip that turns into a muddy delight (if you know your Peppa, you know that means jumping up and down in muddy puddles); another with Gerald Giraffe as a new student in Peppa’s class with her teacher Madame Gazelle, but feeling a little left out from the rest because of his height; yet another with Grandpa Pig showing off his toy aeroplanes when Peppa and George go over to visit; and last but not least, Peppa and her family taking a trip around the world to visit her friends Danny Dog, Suzy Sheep and Pedro Pony who are also on vacation. Yet while there is little sign that the creators of Peppa Pig have decided to sell out their character, it would be remiss if they didn’t at least acknowledge the cultural context of her big-screen debut. Most significantly therefore, Peppa’s concluding segment sees her celebrating the Lunar New Year with her friends and learning the traditions associated with the festival, such as spring cleaning, dragon dance and firecrackers. There is one more segment that sees two new classmates, Peggi and Pandora, joining Peppa’s class, and let’s just say it is no coincidence that both are panda twins whose father happens to be Police Officer Panda. If it isn’t yet obvious, ‘Peppa Pig Celebrates Chinese New Year’ is less a feature-length version of Peppa’s adventures than a loose collection of the usual Saturday morning shorts, strung together loosely by a live-action modern-day story of a family on the eve of the New Year. In a clear parallel to Peppa’s family, this real life one comprises an older girl Tang Yuan, her younger brother Jiaozi and their parents. Jiaozi is especially fond of Peppa Pig, thus creating a convenient narrative bridge into the occasional animated segments. Instead of heading to their paternal grandparents’ place, their maternal grandparents are coming over to visit this year, but comic hilarity (supposedly) ensues when both sets of grandparents decide to show up. Amidst paper cutting and dumpling making, both grandmothers will seemingly compete for the affections and attention of their grandchildren. But you should know better than to expect some all-out rivalry between the two elderly women, given how this is meant to be a family-friendly – or more accurately, child-friendly – movie after all. For every potential misgiving, there is always a song-and-dance number to defuse the tension, so get ready for no less than five live-action musical sequences. Indeed, director and co-writer Zhang Dapeng has fun turning almost anything into a song, including the two aforementioned activities, a squeezy minibus ride, spring cleaning, and even a visit to the toy shop. Truth be told, the whole film feels completely episodic, and the start-stop nature of the storytelling makes it feel draggy and even tedious for anyone above the age of ten. Yet if you’re even thinking about watching this, it is probably because your younger kids love Peppa Pig; and if so, we dare guarantee that they will be entertained, and even excited for the Lunar New Year festivities. This is through and through intended for them, so there is really no point judging the movie on any other measure, lest of course you were one of them disaffected millennials in China who misappropriated Peppa as a symbol of slacker culture. But we digress – if you have a child that loves Peppa, take them by all means and let them enjoy this East-West fusion; otherwise, you probably wouldn’t and shouldn’t bother about this movie anyways.